One might expect that, to learn a piece of music at a rehearsal, you’d start at the beginning and progress measure-by-measure through to the end. But it turns out that there is another way – a most effective, interesting, and creative way – to learn. In virtually every piece, you will find a theme or passage that is repeated throughout, with different variations. Sometimes the passage is repeated in different keys, or the harmonies are shifted among the parts, or the tempo and expression changes. But learning these passages can quickly familiarize you with the essence of the piece. So, in rehearsal, we frequently jump from one page to another. But we usually are following the occurrences of the theme, to reinforce our learning by experiencing its uses and variations. That’s how, in the first couple of rehearsals, we wind up singing from the pieces – all parts, together in harmony. It’s a way to jump start our learning and it helps us see that the music is attainable. Another part of the strategy is to use our time together on Thursdays to learn how the individual parts fit together. We learn our own notes as we practice at home (or in the car). But when you hear the other parts singing along with you, for the first time, it can really be hard to remember your own part! We need to train our brains to hear the other parts as they relate to our own, whether forming harmonious chords or creating an interplay of notes and phrases. So when we are together, Allison will often have one part sing a passage, then another and another. Then we sing in combinations – maybe the Altos and Basses will sing their parts together, or the Sopranos and Tenors. And finally, all four parts are singing together. It sounds amazing! 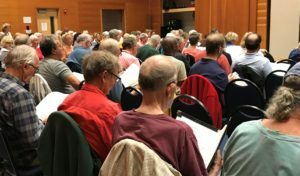 At rehe arsal, Allison shared with us that she has a complete “concert roadmap” – an actual graphic that breaks down each piece in the concert repertoire into its components. These are the building blocks that we will learn and assemble. She knows how well we have learned each of them and what we need to do to bring them together into a musical whole. Soon we will be singing the music from end-to-end. But for now, we’re gradually mastering the incremental segments. Still so much to learn! But it’s starting to feel good!